You’ve been a manager and leader in early stage companies – from startups like Blue Nile (from $0 to $50 million in a couple years) to Walmart.com (from $0 – 5 billion in 7 years). I’m sure each was different but tell us about the experience of scaling such high growth companies? You went from Operator to VC… Why’d you write the book? You present these catchy archetypes in the book… Captain Fantastic; the Solo Flier; Version 1.0; the One-Trick Pony; the Whirling Dervish. Can you give us a brief overview of each and then maybe we can talk about which, in particular, afflict entrepreneurs? Clearly, you’ve thought deeply about the personal side of entrepreneurship and the psychology of founders. When you’re looking at new deals, what sort of traits are you looking for in the founders? You and I have discussed your “Launching and Leading Startups” class at Kellogg– what do you focus on in the class and why? 1. Professionals can activate faster by taking their skillsets to an early stage company. 2. A company can’t scale without a value proposition that works. One has to ask, is the product necessary to the consumer? 3. Always test critical assumptions that will allow one to gauge product market fit. 4. The most important factor in business is team and the ability to hire good people. 5. Once a company starts scaling, hiring becomes quicker, but a rigorous hiring process with reference checks is necessary. 6. Carter advocates defining business “growth governors”- factors that stop growth or faster scaling. 7. Stay very connected to customer experience; its easy to lose sight of customer thoughts. 8. Startups should focus less on large incumbents and more on other fast-moving, agile startups. 9. Founders have to know where the market is moving, what future disruptions are, and the impact each will have. 10. It is very rare that a value proposition remains the same throughout stages. Instead a good management team can pivot to adjust to changing conditions. 11. Three characteristic of top performers include tremendous drive for results, learning agility, and the ability to enlist others support. 12. When hiring, pressure test candidates before-hand by learning how much they read, listen, and socialize. 13. One should always explore multiple versions of themselves; while it is good to specialize early on for a skillset, one should always explore other possibilities mid-career. 14. 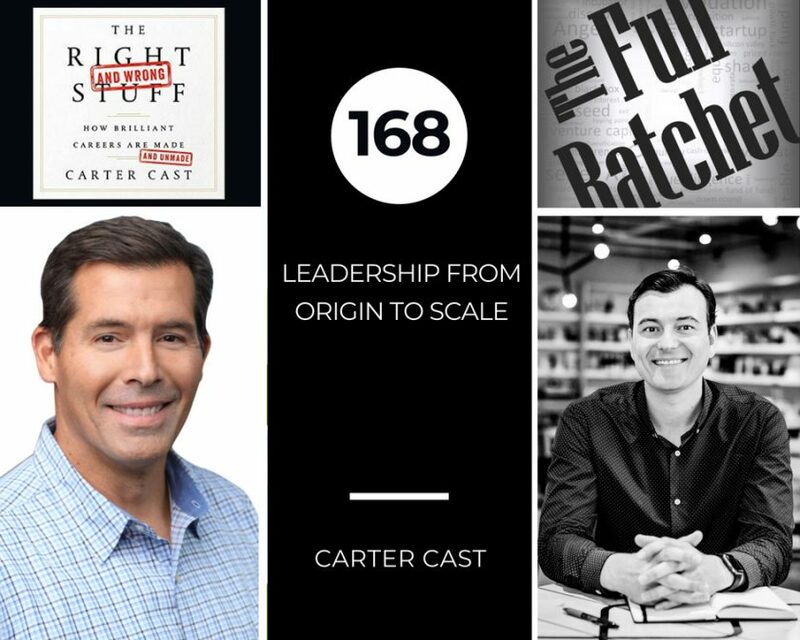 Carter’s book, “The Right (and Wrong) Stuff: How Brilliant Careers are Made – and Unmade”, explores why talented and good people run into trouble. 15. Egos have to be put aside to enlist others to work with you. 16. A good founder has a good balance of execution and team delegation. 18. Start-ups fail because they try doing multiple channels or products at the same time. 21. Founders should focus on customer segments, channels, and critical product aspects instead of keeping optionality open. 22. The number 1 self-reported issue for professionals is being a Whirling Dervish- trying to do too much at once. 23. Success is always determined by the customers. 24. Founders have to have true passion, resilience, optimism, and listening skills. 25. There are 5 life cycles: incubate, start up, scale, growth, and mature and each requires a different skill set to lead. 26. What industry and stage one is interested in is more important than their desired functional area. 27. Investing in a good management team and staying out of their processes, is the best way to operate.